NEW: Donte Stallworth offers his "deepest condolences to the Reyes family"
State attorney calls judgment in DUI manslaughter case "just"
MIAMI, Florida (CNN) -- Cleveland Browns wide receiver Donte Stallworth will spend 30 days in jail for a DUI manslaughter that killed a construction worker in March under terms of a plea agreement, prosecutors said Tuesday. 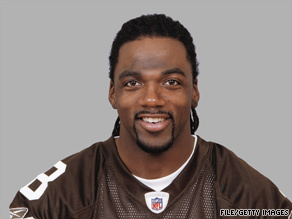 The Cleveland Browns' Donte Stallworth can continue to play football, but his driver's license is revoked for life. Stallworth, 28, pleaded guilty in a Florida court Tuesday to killing Mario Reyes while driving under the influence of alcohol. He began serving his sentence immediately, said Terry Chavez, spokeswoman for the Miami-Dade state attorney's office. With his mother, Donna Stallworth, at his side, Stallworth offered his "deepest condolences to the Reyes family." "Though I cannot bring back Mr. Reyes or ease his family's pain, I can and will honor his memory by committing my time, my resources and my voice by educating this community about the dangers of drunk driving," Stallworth said in court. State attorney Katherine Fernandez Rundle called the judgment "just" and said that Reyes' family supported the plea agreement. Stallworth cooperated with police and did not have a record of traffic violations or criminal convictions, she said in a news release. "Although no sentence can ever restore Mr. Reyes to his family, the provisions of this plea will provide closure to them and appropriate punishment for Mr. Stallworth's conduct and the effects of his actions that night," she said. Stallworth reached an "amicable" financial settlement with the Reyes family, his lawyer, Chris Lyons, told CNN sister network HLN. He would not disclose the amount, but said the short jail term "had nothing to do with Donte Stallworth being a celebrity, a professional football player or money." "Everyone today thought it was a fair and just result, including the judge," Lyons said. Stallworth has shown "genuine remorse" and accepted responsibility for his actions, the lawyer said. "He already had dedicated his life to serving the community outside the public eye," he said. "He is really looking forward to the enormous responsibility that he has to go out there around the country, giving public service announcements, speaking at high schools about this tragedy, so that people can learn from this and not have it happen again." After his release, Stallworth faces two years of house arrest, but he can still play professional football, Chavez said. The Cleveland Browns declined comment. Stallworth's plea agreement also requires that he donate $2,500 to the activist group Mothers Against Drunk Driving. He will be on probation for eight years and must submit to random drug testing and drug and alcohol counseling for the entirety of his probation, Chavez said. His license to drive was revoked for life. Stallworth was driving his black Bentley GT east on the MacArthur Causeway, which connects Miami to the South Beach area of Miami Beach, when he struck Reyes, according to a prosecutor's statement. Stallworth told the arriving officer that he was the driver of the car and said, "I hit the man lying in the road," according to a court document. Stallworth had been at a Miami Beach club earlier and had been drinking, according to court documents. The veteran NFL player's blood-alcohol level was 0.126, Chavez said. Florida's legal limit is 0.08. Reyes suffered "critical head, chest and abdominal injuries" and died at a hospital, according to court documents.